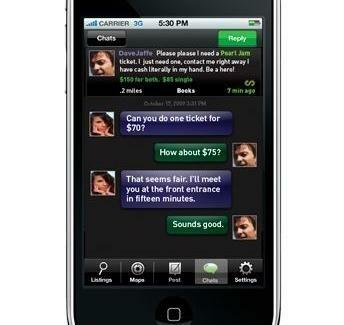 Conceived by a music-festival goer frustrated that his iPhone couldn't track down the nearest cheap beer, Ant's a free app that combines features of Foursquare, Twitter, and Craigslist to create an all-purpose, classified-centric marketplace based on users' geolocation -- which actually has little to do with cheap beer, but is a project you're more likely to work on when you can't find it. The skinny: to sell or buy a specific item, simply post a "micro listing" to the supply/demand chain; if you're a browser, search by keyword, category, location, or proximity, and the GPS will satisfy your urgent need for a microwave/amp/adorable puppy, hopefully all to be used in one hard-rocking satanic ritual. Services operate in similar fashion, with details sortable via their private Antweet messaging system, thereby quickly helping with carpooling, couch-moving assistance, the borrowing/lending of nearly anything, and finding last-minute guests to shore up events, e.g., an SDSU fundraiser for an SAE "rain garden project" (if that's not code for something, those E's are about to get their charter yanked). 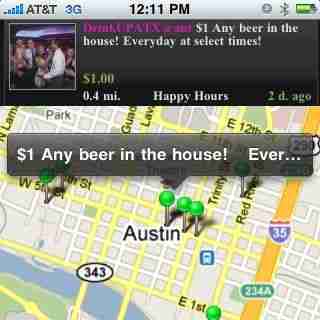 Beyond the e-marketplace, Ant facilitates a number of social services (location-based dating, sports & activity organizing) and, in furtherance of their original inspiration, has partnered with Drink Up Austin to provide constantly updated listings of nearby happy-hour specials -- though after receiving an Antweet to "meet on corner in 5 to pick up savings bonds", you're already intoxicated on life.